In this photograph, a beautiful bride wears her wedding dress and holds a stunning wedding bouquet. This wedding bouquet is designed in a cascading style. 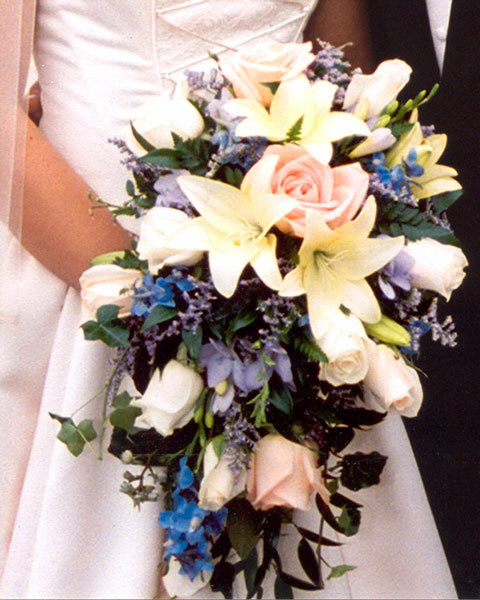 The white and pink roses and the lilies are enhanced by touches of blue flowers and small lavender filler flowers. Ivy, fern, and other greenery accent the bouquet. This bouquet beautifully showcases the lace on the bride's gown. A close-up photograph of titanium wedding and engagement rings, set romantically atop a peach-colored rose. The blurred background includes smaller white flowers and greenery.